There are a variety of shower doors available to choose from and sometimes making a decision to pick one can be challenging, here we have provided some information and steps on the different shower enclosures available to help you decide on which shower enclosure would be best suited for your bathroom. Below we have provided you with three simple steps to help you determine the right shower for your bathroom. Firstly, consider the available space in your bathroom for your shower, this will help you to narrow down the options. You can look at whether a full shower enclosure, single door or just a bath screen would be best suited for your bathroom. Consider outward opening shower doors when reviewing your bathroom space, are there any obstructions which need to be avoided?. If space is limited, there’s a considerable amount of compact luxury showers available for you, consider a corner shower enclosure, or a bath screen, both suitable replacements for saving space where necessary. For the larger bathrooms with more space available there’s a variety of larger sized shower enclosures available for you to select from. Secondly, consider the location of your shower, determine where your shower would be best positioned, one of the most popular and practical positions for the shower enclosure is the corner location. When considering the positioning, determine the shape that would be best suited for your allocated position, the shape of the shower can be measured via your existing tray if you already have one there. The shape of your shower will depend upon available space for door manoeuvres and any other bathroom fittings, primarily, the opening and closing of the door will have to be considered to avoid any obstructions which may restrict the door movement. If the shower has to be positioned against a flat wall, consider a D-Shape enclosure, offering you definitive looks for your bathroom. Bath screens can also be considered, combining both the convenience of a shower and the comforts of a bath. When selecting a bath screen remember that there are different lengths heights and styles. Thirdly, once the space and location has been decided, consider how you would like your bathroom to look, envisioning whether you want your bathroom to be traditional or modern, there are a variety of shapes, sizes, frame finishes and colours which can help you to achieve the look you want for your bathroom. Frame finishes usually come in two available colours either white or silver combined with a choice of clear and sometimes patterned glass. What size is your bathroom? Where will your shower be positioned? And how would you like your shower to look? The hinge shower door simply functions by two fitted joint hinges attached to the side panel of the shower enclosure, offering you widespread accessibility, the hinge shower door operates just as any standard opening door giving you complete access, space and ease when accessing your shower. When considering the hinge shower door, inspect the available space within the bathroom, consider the outward opening space of the door, and check if there are any obstructions which could hinder any door action, if there are any obstructions e.g. bathroom fittings, consider the sliding door, or for the more compact bathrooms a bi-fold shower door complete with inward door action, compared to the pivot door, the hinge shower door opens further giving you ultimate access. The pivot shower door, an outward opening shower door, specifically designed to offer you one of the easiest points of access to your shower, the pivot door is fitted with two pivot points from the top to bottom which enables the door to open and close, these are usually positioned one-third in from the side allowing the door to swing into the shower while opening the door, this differentiates from the hinge shower door as the hinges fitted are positioned on the side of the door rather than top to bottom, the pivot door itself can function with considerably smaller shower enclosures than the hinge opening, but still offers easy, spacious access to your shower. The advantage of a pivot shower door is that the hinges are not exposed to water, reducing any rust, and takes up less bathroom space during door clearance, the pivot door is efficient in accommodating for the larger doors. The sliding shower door one of the most popular door choices, usually chosen and fitted for both smaller and larger bathrooms, the sliding door is crafted with overlapping panels which allow the shower door to effortlessly slide across smoothly, allowing enough room to access your shower, the sliding door is suitable if outward door exposure to the bathroom is minimal. 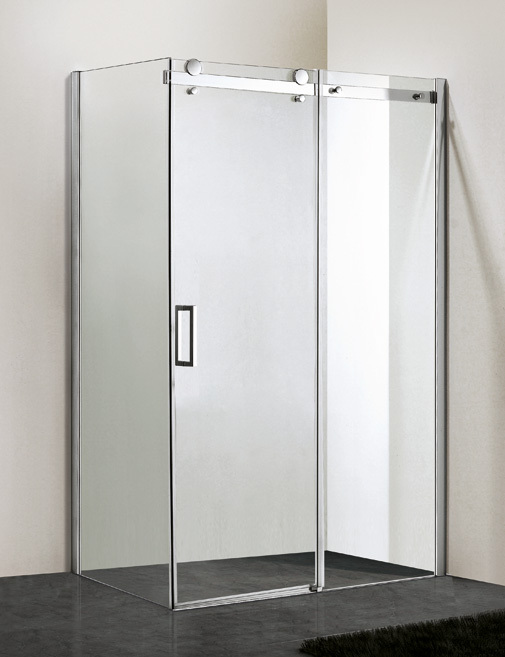 The sliding door compared to other shower doors usually will only have two large pieces of glass allowing this shower door enclosure to be easily cleaned, the sliding door will be one of the best suited options for your bathroom if space is limited, giving you enough access space. The bi-fold shower door, easily fitted, compact and ideal for areas where space has to be considered, the bi-fold shower door functions by the panels’ opening inwards into the shower and then folding into each other, the bi-fold door is suitable for bathrooms where door manoeuvres could be challenging, this shower door allows full access to your shower without the worry for clearance space for outward door openings wherever your shower enclosure is situated. The bi-fold having the luxuries of operating like a door virtually takes no space in the bathroom when opening, compared to the sliding door, the bi-fold offers extra space when accessing your shower, the bi-fold is an easy to clean shower door, offering you ultimate access. If space is limited within the bathroom, the bi-fold would be the best suited for you, giving you a compact, well fitted shower door suitable for you. 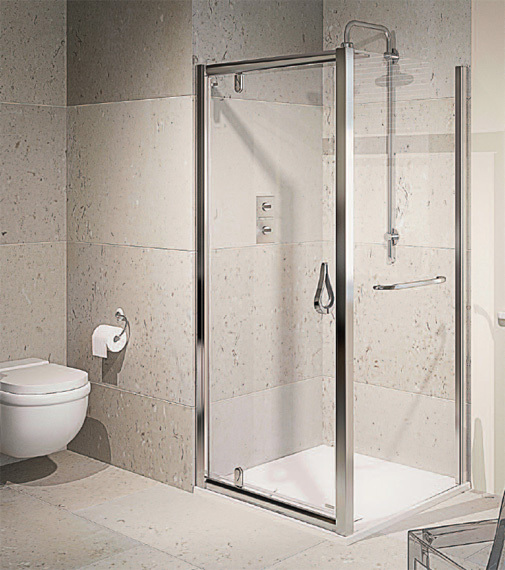 • Where space may be limited the Bi-fold shower door is one of the best options. The quadrant shower door a popular choice, elegantly designed with curved glass, the quadrant enclosure fits rightly within any bathroom corner, the doors of the quadrant shower enclosure can be either from a hinge opening or slide opening, the quadrant shower enclosure is spacious, and allows large easy access to your shower. A quadrant shower enclosure is suitable for both the smaller and larger bathrooms, but is considered best suited for smaller areas if the shower is situated in the corner of the bathroom, compared to the hinge and pivot, although they both offer space, the quadrant shower door is superb. At MBD there’s a variety of shower doors available to accommodate any bathroom, our easy to use website features high quality built Shower Enclosures, Baths, Bath-Screens and other Bathroom Accessories, from a range of sizes, designs, shapes, styles and brands, you are sure to find your bathroom needs here.